The saga of Tiller the Hun continues. As you may remember, Tiller the Hun dragged its anchor in a winter storm, ran into the rocks and sank. There were some salvage efforts encouraged in part by extreme low winter tides that exposed a good part of the Tiller's hull. But those had ceased. 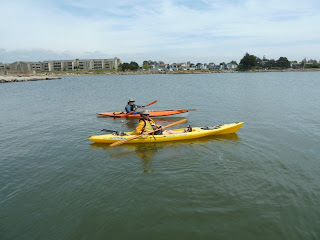 Yesterday, I passed the Tiller again and discovered more activity around the Tiller. 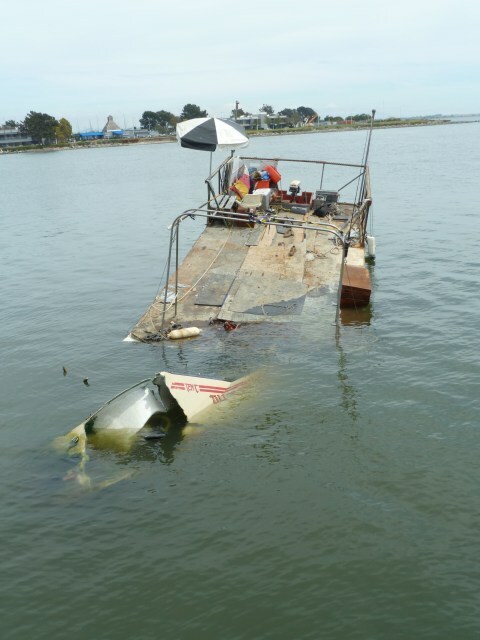 At first, it looked like another boat had tried to sink itself in the same spot as the Tiller. 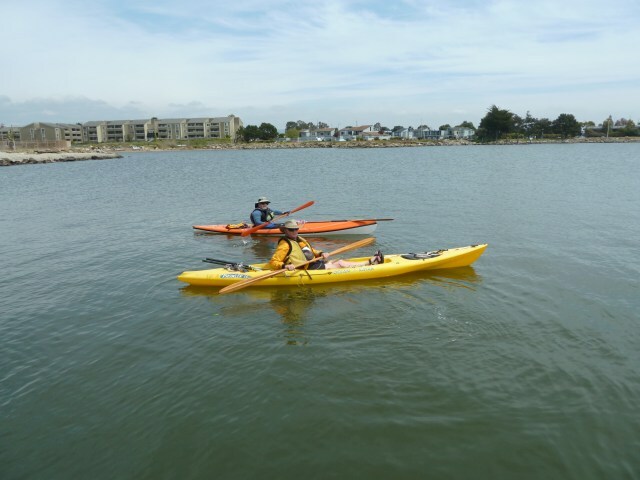 Fellow kayakers Glen and Tony were in the area and had spoken to the person that the apparent new wreck belonged to. Apparently, it was not a wreck at all, but a salvage attempt. 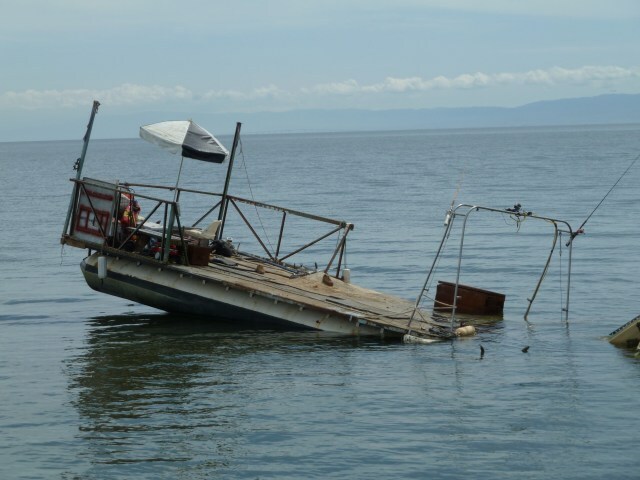 According to Tony, the owner of the salvage vessel was hoping to drag the Tiller into shallow water where he could dismantle it at his leisure and without having to put on diving gear. So the salvager tied his salvage craft to the Tiller and waited for the tide to come in. 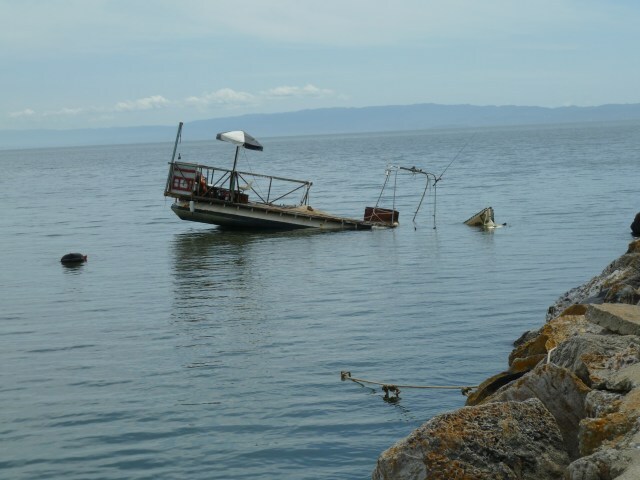 Apparently, he misjudged the weight of the Tiller because once the tide came in, his boat, instead of lifting the Tiller had one end of it dragged under water. 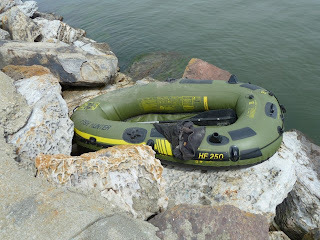 At one point, the salvager jumped up and down on the dry end of the salvage boat, perhaps to shake something loose, but failing at his attempt, abandoned the salvage effort for the time being and went ashore on his rubber raft. I didn't stick around for low tide to see how things would go. 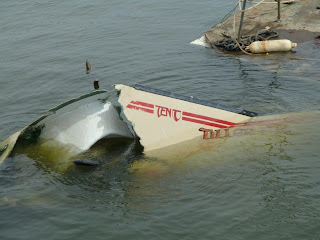 The transom of the Tiller was entirely gone. And the back end of the salvage craft was sticking out of the water like a duck feeding in the mud. Well, almost.